I’m going to be offering the pulse warmer pattern in several sizes, but want to be sure I make them to fit a good range of wrists. Since my wrists are the size of a 4 year old’s, according to the standard sizing I’ve found, I worry my sense of scale is off kilter and I’ll end up leaving an important size off the pattern. Would you mind measuring some wrists and taking the poll below? I’m thinking women and children are going to be the only ones interested in wearing this particular pair of pulse warmers, so let’s stick to them for the poll. If your wrist is 3″ or 17″ or something, leave a comment, please! I feel so “normal” with my 6″ wrists!! Had no idea until today that they were average wrists!! I got just under 6″ (voted for 6″), and I have pretty darn wimpy wrists. I’m impressed that there are adults with 5″ wrists. I got just under 6″ too. Based on every watch and bracelet I’ve ever owned, I assumed that my wrists were pretty small. Lucky I had my tape measure at work! mine were 6.5 also! Mine are 6.5″. I measured right in front of the knobby wrist bone. My son, who is 4, has a 5″ wrist. I voted for mine, which is 6.5″. I absolutely cannot wait to get my hands on this pattern. I measured 6.75″ and voted for 7″. You were in the Daily Candy Weekend Guide as the thing to Buy. Should up the store traffic a bit. Mine are 4 7/8″. Most bracelets are huge on me. My 2-year-old’s wrist measure 4 1/2″. Mine actually measures at 6.75″. phew i thought i was a freak. i measured at 6.75 and voted for 7. I don’t have a measuring tape with me at work, but I’ll do it later…I wanted to congratulate you on your Daily Candy mention! Hi, delurking to give you my wrist measurement and also to tell you that I saw you on Daily Candy today- very cool! I’m the fat lady with 8″ wrists. I measured again just to be certain. I always need a custom bracelet size and watch extensions. I’m leaving you a comment instead of voting: my wrists are exactly 6.75 inches. I thought I had a big wrist at 6″. 6.25 for the left wrist, 6.5 the right so I voted for 6.5. 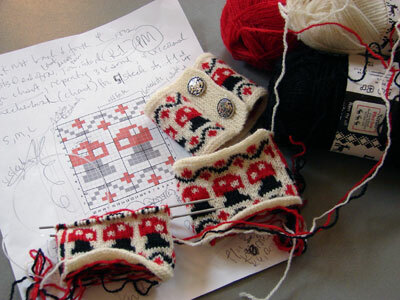 I’d knit the wrist warmers for the cuteness factor only, as I’d never wear them. I just wanted to say congratulations on being in today’s Daily Candy!!! I pattern costumes for professional theatre for a living. Wrist circumference is a standard measure we take on every actor. In my experience wrists don’t have a real large range of variance. If more men were answering your pole you’d probably find 7″ to be your most common measure. I doubt you’ll find more than two adults with wrist sizes under 5.5″ or over 8″. If you stay in that range you should be golden! What a surprise in your poll. I always thought that my wrists were so bony at 6″ and here it is as the majority (in your poll at least). I’m kind of a small woman (5’1″ and 115lbs) with very small hands. My wrists are about 4.5″ around. I lovelovelove this pattern and the wee ‘shrooms. My wrists are a sturdy 8″. I guess I never realized that my wrists are big. Huh. I was so happy when I saw that you had included a size for 5″ wrists :_: At 5’1″ and 110 lbs, I’m always having to use smaller needles to get a snug fitting wrist. Thank you!